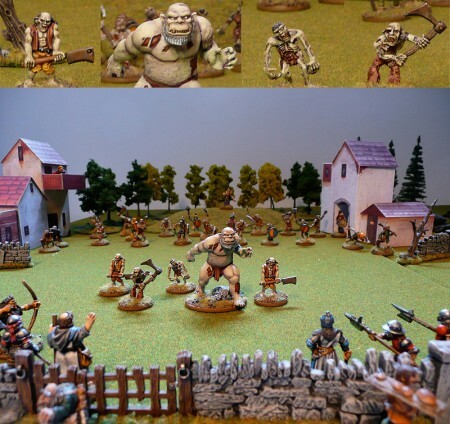 Was going to post a bunch of orcs, but the photos were too poor so they will have to wait. 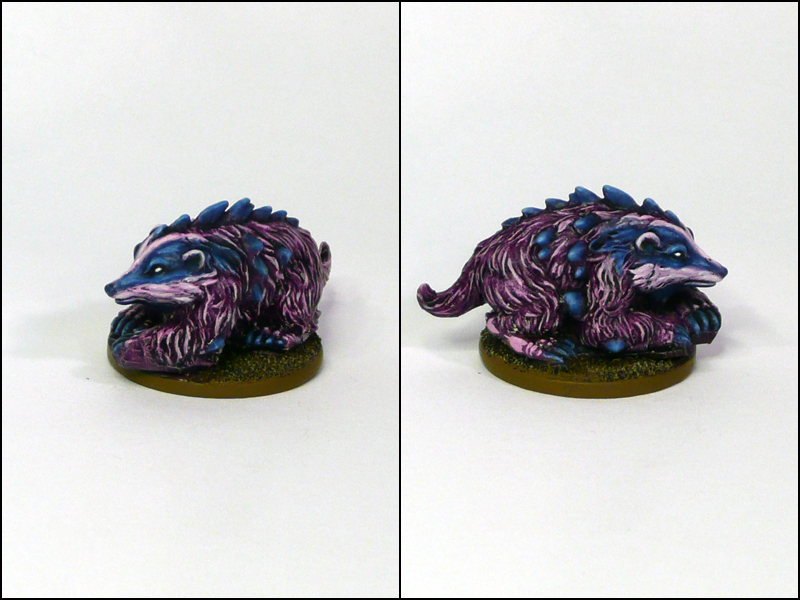 Instead, here’s an old D&D Miniatures Girallon (from the Night Below set) that I did a full repaint of recently. I had to do a little greenstuffing on him, filling a few gaps and sculpt over them with fur texture. Turned out good, but the piece on the head looks a bit like a head piece. 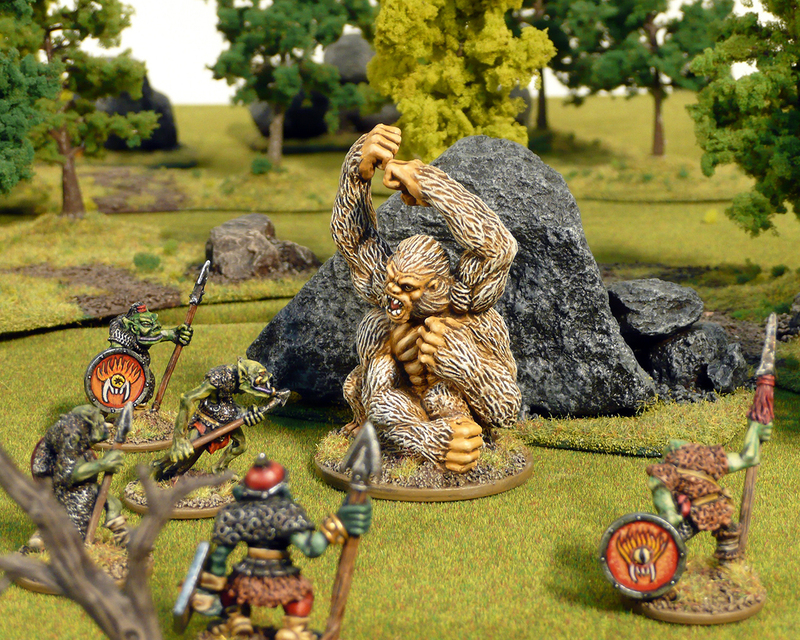 The fierce mutant ape, cornered by a hunting party of orcs. 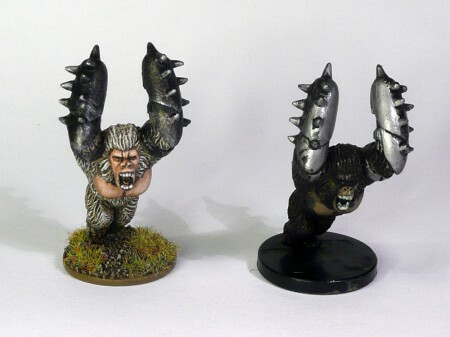 As usual with repaints of D&D minis, the original miniature wasn’t much to write home about. Ever since I got the model, I have been looking forward to painting it though. Here’s a before photo, nabbed from the Internet. Original paintjob of the Girallon. I didn’t bother with priming or anything, instead I base coated the whole model in a leather brown and then just went to town drybrushing and washing everything up with flesh tones progressing to pure white. It’s a fun, dynamic model with an expressive face. Rather versatile too – it could just as well smash things to a pulp in a fantasy setting as in the grim darkness of the future. 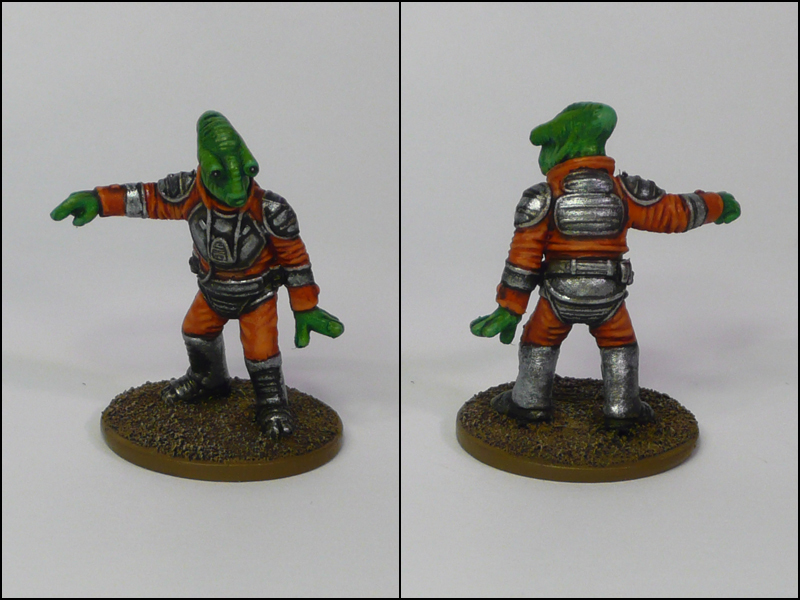 Now, I think I need to dig up the other Girallon model done by WOTC. Fiendish Girallon – pic courtesy of some random eBay seller. 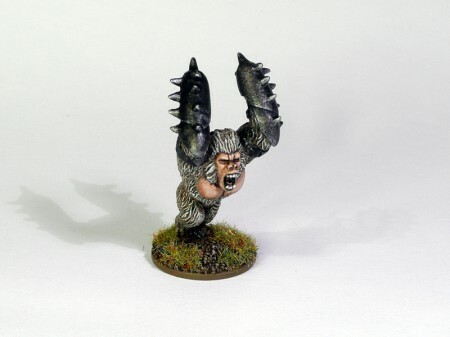 I’ve painted another model for the I’ve never painted a… before club over on the Oldhammer forums. 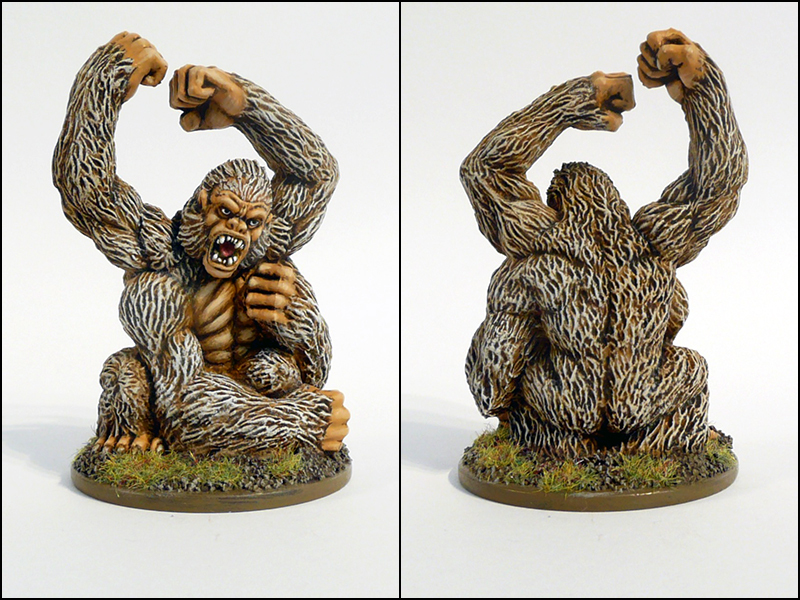 Actually, I painted three – but here’s the first one of three war apes. 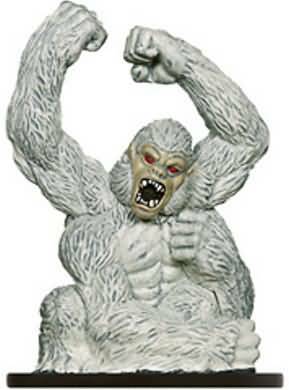 I’ve had these guys for yonks, and always liked the sculpt but abhorred the original paintjob. I have a tray of DDM prepaints that I’ve rebased and I’m going to repaint at some point or other. These guys were on it. Now they’re painted, in the cupboard, with only a few measly hours on them all in all. The paintjob was very quick; it’s just a base coat that have been drybrushed up and washed over with a final highlighting drybrush on top of that. Still looks so much better than the original. As I mentioned, I did two more. Here’s a shot of all three. I went with slightly different base coats and highlights on each, since they’re already identically posed. 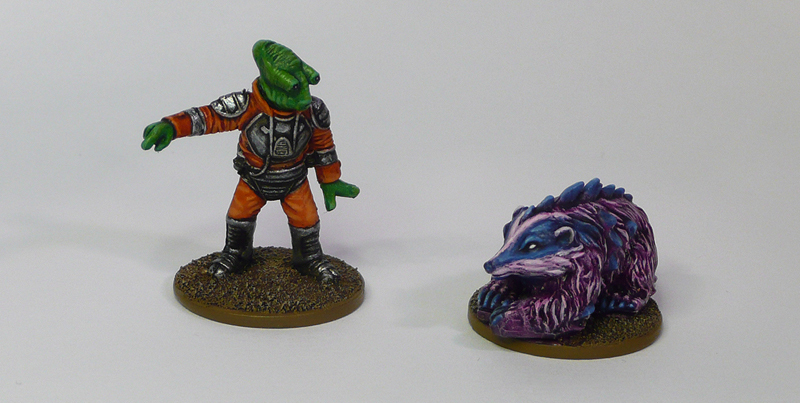 As you’ll see in my coming posts, these guys will fit just as well in a fantasy setting as in a scifi game. Here’s my entry from round 4 in the LPL at LAF. The team itself is the group of five zombies in the center. The rest are just dressing. Took some tinkering before I got a picture I was satisfied with but I think it paid off in the long run. Most of our old mates from Stillburg are in it, and all the zombies I’ve painted to date (23 counting the big fellow). Unfortunately, I was facing one of my oldschool Citadel buddies Pil and he was also doing some undead. I wasn’t sure where this would go, as I thought his photo was really good. I did manage to score a rather solid win though. Too bad it was at a mate’s expense. "You wouldn't like me when I'm zombie..."
Here’s the photo I used for the inset close ups on my entry. Thought it was rather nice, but my wife insisted I should go with the other – and I suppose she was right. Anyways, from left to right we have the following: A plastic zombie from my old Hero Quest set, a C18 zombie by Kev Adams that I’ve “repaired” (his ankles were almost snapped off) with an excessive amount of greenstuff (he’s now wearing flared trousers), a repainted plastic Zombie Hulk from Wizards of the Coast’s D&D Miniatures range (Savage Encounters set), another C18 zombie with a head swap (second time I got this mini for free from Paul/cheetor/Sho3box) and finally another of the plastic Hero Quest zombies (only two in the box, so I can check that off). I’m pleased with how they turned out, even if it was a bit of a rush to get them done in time for the deadline. It’s actually the worst aspect of the LPL; you might have to rush through miniatures you’ve been longing to paint for a long time. On the other hand, you get things bloody done! I’ve painted about 40 miniatures so far this year. It’s currently week 14, so I’m quite ahead of schedule to reach my goal of one miniature per week. Yay me, huzzah and so forth. Miss Catherine and her band of warriors have now acquired the old talisman they need to access the riches hidden in the pyramid of Sankar. They reach their final destination at dawn, and with their blades at the ready emerge into the clearing in which the pyramid is located. Automated metal guardians stir to life as ancient seals of warding are broken by the talisman’s presence. 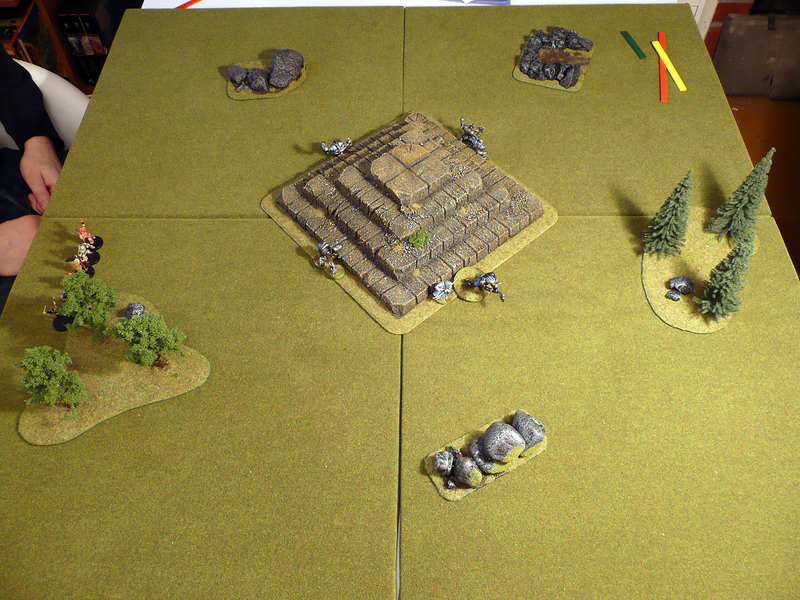 Scenario specific rules: The pyramid is located in the centre of the battle field. 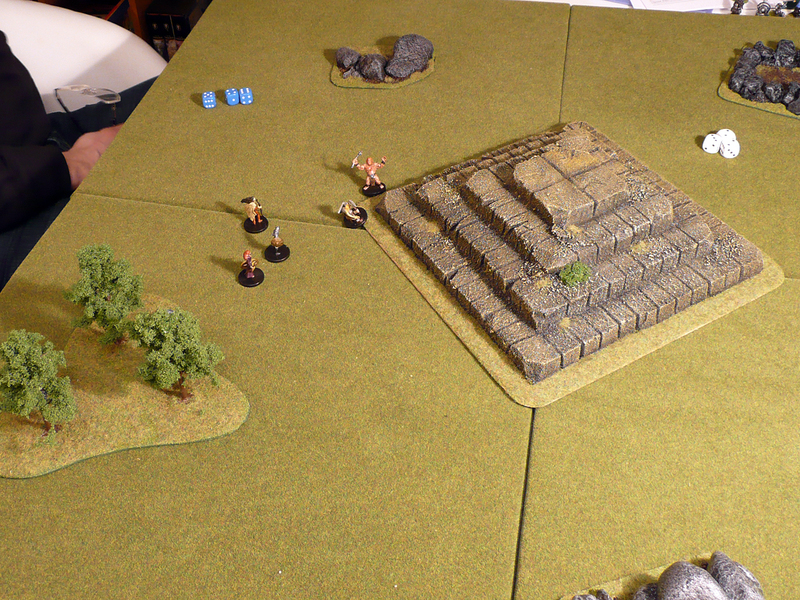 The defender (that’s me, playing the guardians of Sankar’s pyramid) deploys his forces either in base contact with the pyramid or on the first level of the pyramid’s steps. The attacker then assigns the values 2,3,4 and 5 to each table edge and rolls a D6 to determine which side he’s deploying on: 1; Defender’s choice, 2-5; the assigned side, 6; Attacker’s choice. 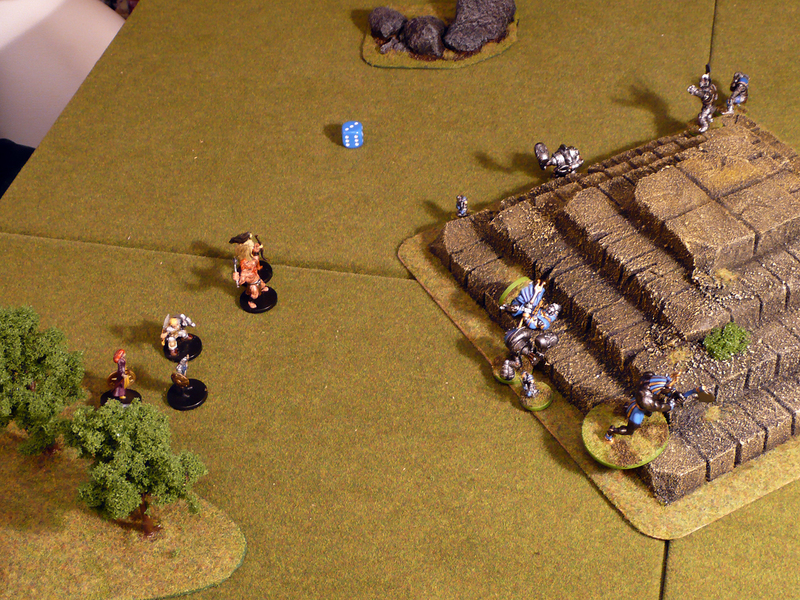 As you can see above, Fredrik deployed miss Catherine and her trusty companions on the “western” edge, while my automaton guardians are spread around the pyramid. The goal of the attacker is to reach the top tier of the pyramid with the talisman bearer (assigned pre-game) and spend 3 actions in one turn with that character to activate the powers of the talisman. The objective of the defenders is simply to stop the attackers from reaching their win condition. Fredrik’s warband consisted of Catherine (human leader), Creed (human berserker), Summer (human magic-user), Blink (elf archer), Tora (dwarf warrior) and Ana-Marie (human thief). My guys were a bunch of Q4 heavy hitters: Sergeant (Q4, C4, Champion), Magic-user (Q3, C1, Magic-user), Fighter (Q4, C4), 2 x Hammerer (Q4, C4, Short move), 2x Sneaks (Q4, C3, Stealth), Golem (Q4, C5, Big). All had “artificial” trait as well. 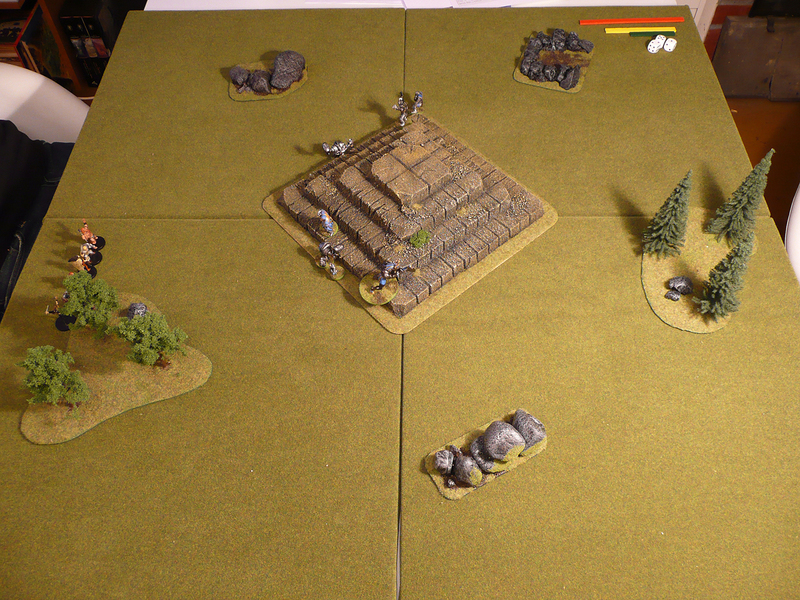 I started with initiative, and managed to move my guys around a bit before failing two activations. As always, click the image below for a larger version. Fredrik’s first turn was a bit more eventful, as he managed to move forward and Blink took a shot at my Magic-user which actually got him to fall. Turn two was very inactive for both. I moved one of my sneaks, and then when I actived my magic user with two dice to stand him up I failed both! 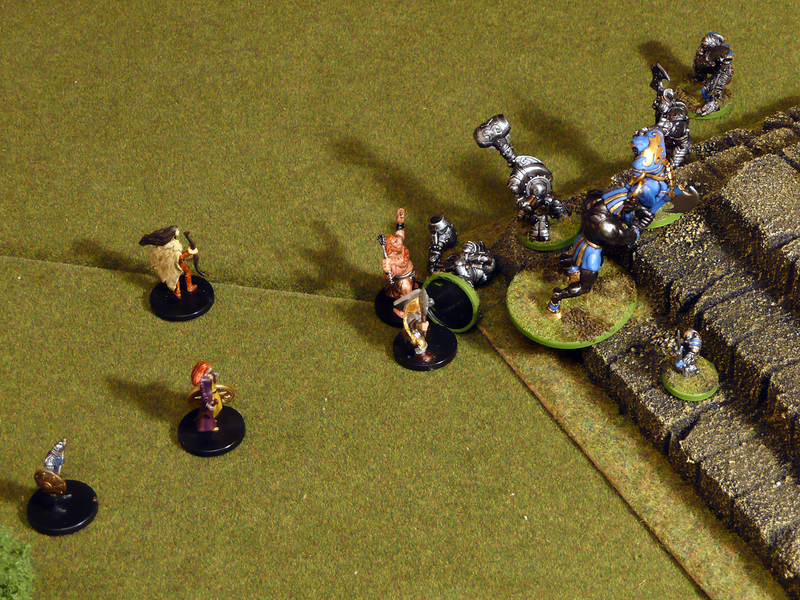 Fredrik was even worse off though, and failed with two on his first activation (Creed, the berserker). I then had a pretty decent turn, as I activated all of my characters. I tried positioning defensively around the first tier on the pyramid as that would give my guys some bonus. 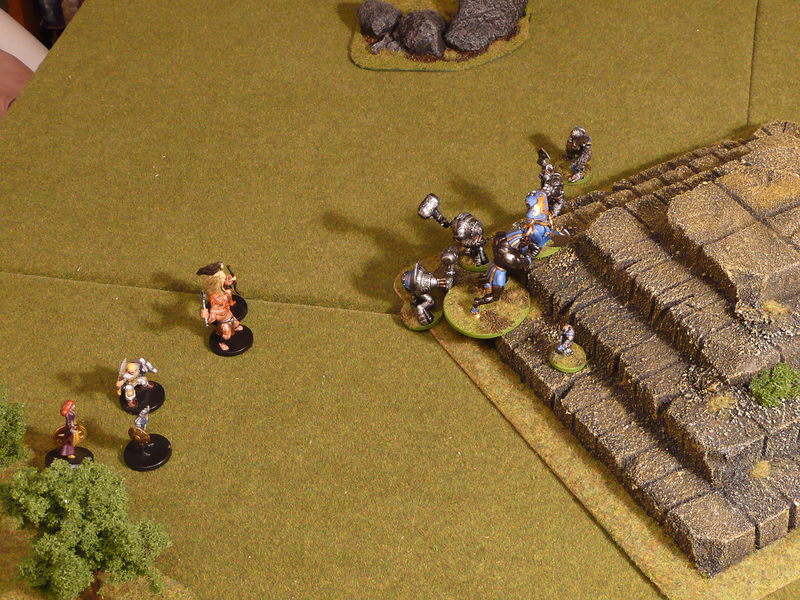 I put the hammerers (tough but slow) as some sort of bait on the ground. Fredrik’s troops were not late to go for the hammerers. 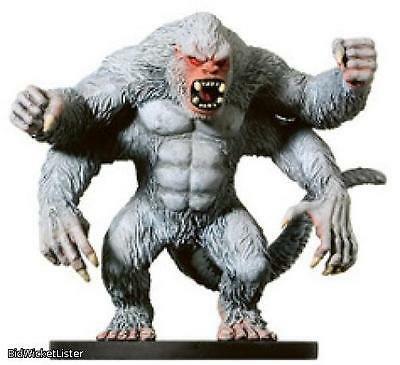 First his magic user Summer attempted to transfix my Golem, which failed as I passed the two-dice Quality test. Blink missed an aimed shot at the nearest hammerer and then Tora and Creed moved up on it, failing to cause any damage though. I started my next turn with a successful transfix of Creed. With a golden opportunity, my fighter failed to activate and the turn passed to Fredrik. Fredrik broke the transfix on Creed and went on to take out my hammerer but failed to do much else. I tried to respond in force. 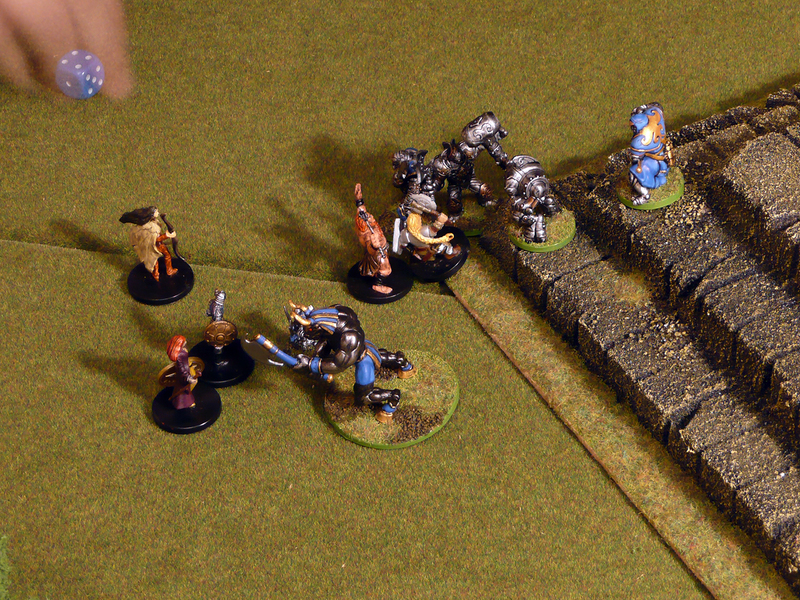 My golem moved down from the ledge and attacked Tora, the dwarf warrior. She was merely pushed back though. My magic-user attempted to transfix Creed, which also failed. My other characters moved about a little, and then I did the mistake which would cost me the game. My champion moved forward and attacked Creed, but failed and was pushed back. One of my sneaks tried to squeeze in and attacked Creed too, but failed and fell! Creed smashed the sneak to smithereens with a powerful attack, and Summer transfixed my champion. 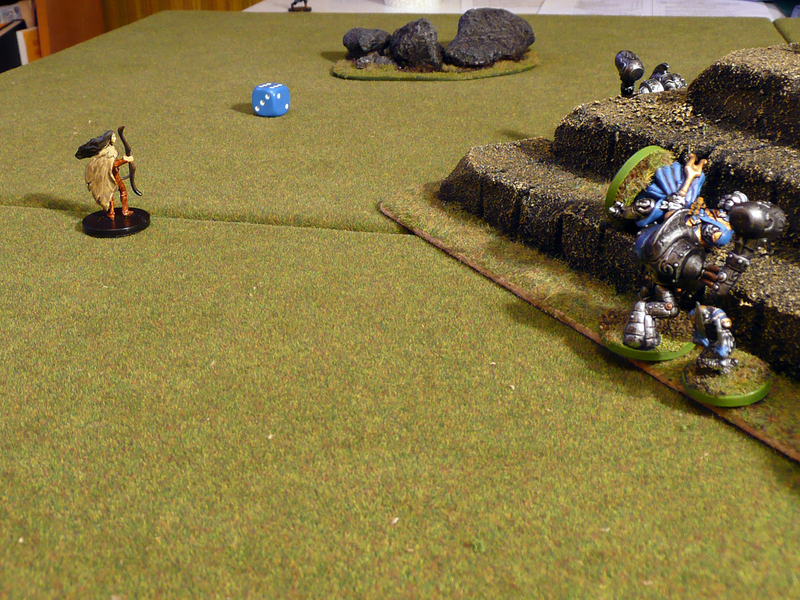 Tora rushed forward and aimed a powerful attack at my champion, but I lucked out and we rolled a draw! Blink took an aimed shot at my fighter, but missed. Catherine and Ana-Marie had not been participating in the battle so far, but now Catherine moved up while Ana-Marie stayed at the edge of a woods section (not in the image). My champion managed to break the transfix spell, and boosted by this I decided to gamble on my golem. I activated with three dice and all succeeded! He dashed forward, and attacked Fredrik’s leader Catherine with a powerful attack… which resulted in a push-back of Catherine! =( My magic-user then attempted to transfix Catherine, but failed to activate. Summer started Fredrik’s sixth turn by transfixing my champion. Tora, who was in base contact already did a powerful attack but once again I lucked out and rolled a draw! I was all out of luck though, as Creed circled around and with the assistance of Tora managed to kill my champion. 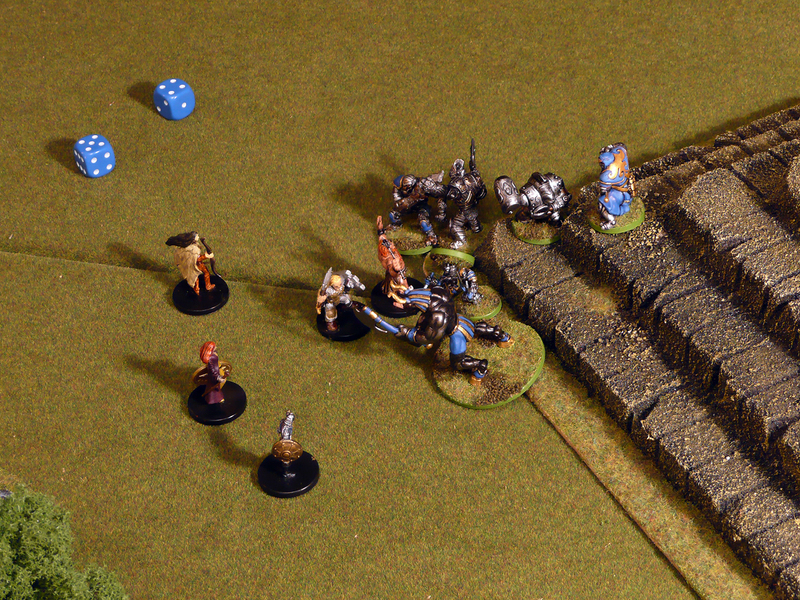 All 5 of my remaining models failed their morale tests with at least one dice, and none of them could flee towards the nearest table edge without passing any enemies within a short distance. They were all wiped out and Catherine’s gang could without suffering a single casualty pillage the treasury of the pyramid! I was pretty let down by this abrupt end, and so was Fredrik. I did make a misstake when I moved my champion to the front-lines, I admit that. We still don’t think the ending was fair – or more importantly; it wasn’t fun! 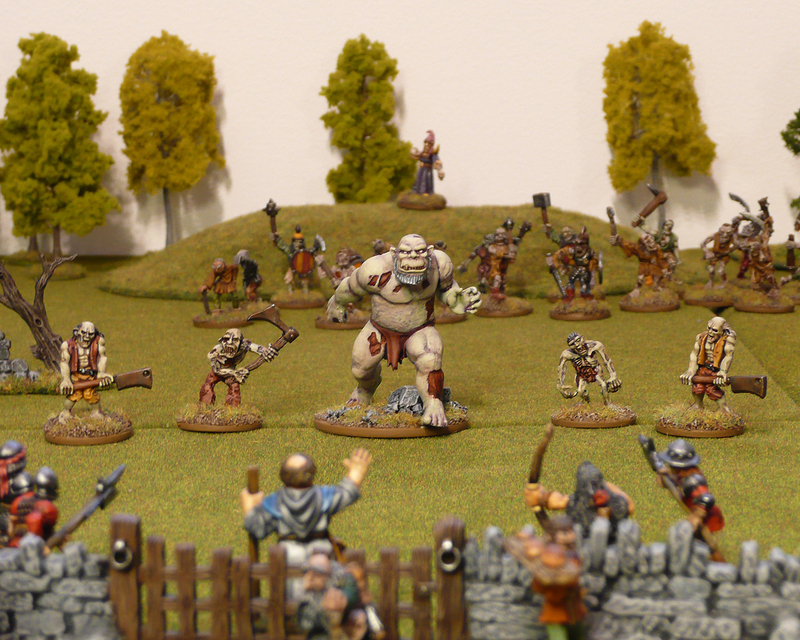 The main problem here was the way my remaining models were forced to flee into the arms of the enemies. In conclusion, a neat little campaign – with a surprisingly abrupt ending. 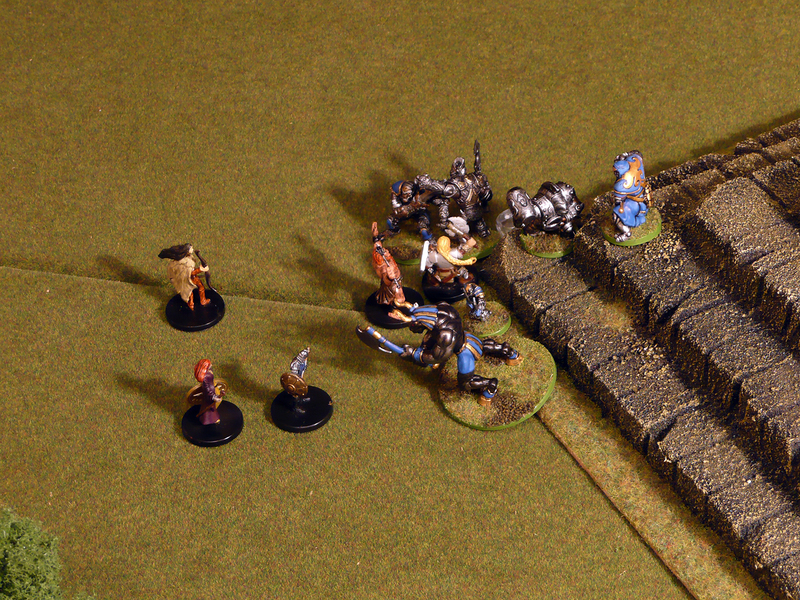 A pity that, especially as I had built the pyramid especially for this scenario and painted a few D&D Warforged for the occasion! Coming up; I’ll post a short tutorial on how I did the pyramid. Also, a close-up on the painted Automatons!